Do you want to know more about this day? On the fourth Thursday of November, the United States celebrates Thanksgiving. This national holiday honors the pilgrims that arrived on the Mayflower and their 1621 Harvest Feast known as The First Thanksgiving. The Plymouth Colony was a group of English Puritans who wanted to break away from the Church of England. However, long before Europeans arrived, the area was inhabited by many native Americans. The Wampanoag people had lived in the area for centuries, but a few years before the Mayflower landed in New England, an epidemic of disease had wiped out much of the native population. When the pilgrims reached Cape Cod, they were incredibly unprepared for the winter,and this was really hard. Due to their desperation they robbed corn from native Americans´ graves and storehouses. But even then, half of the colony died within their first year. So in March of 1621, a formal agreement was made between the settlers and the native people to protect each other from other tribes. When the pilgrims and the Wampanoag sat down for the first Thanksgiving that year it was likely just a routine English Harvest Celebration. 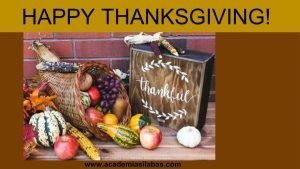 Nearly 250 years later, in 1863 President Abraham Lincoln declared Thanksgiving a National Holiday to give thanks and to try to heal the wounds of the Civil War. What do Americans do this day? Americans love this day , they eat with their families, watch American football and the Macy’s Thanksgiving Day Parade on TV. pumpkin pie, cranberry sauce and various fall vegetables. American football is one of the many traditions in America culture associated with this day. Since 1924 , in New York City, the Macy’s Thanksgiving Day Parade is held annually every Thanksgiving day from the Upper West Side of Manhattan to Macy’s flagship store in Heald Square , and televised nationally by NBC. The float that traditionally ends the Macy’s Parade is the Santa Claus float , the arrival of which is an unofficial sign of the beginning of Christmas season.